Port FitzRoy and the North Barrier area have a long history. 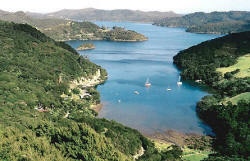 Originally settled by the Ngati Wai, they were joined by European settlers in 1838. Descendants of both still reside in the area. Walking tracks allow visitors to experience the lush native bush and it's hidden treasures, crystal clear streams, abundance of wildlife and the site of the historic kauri dam which was destroyed in a storm in June 2014. Port FitzRoy is the ideal base from which to walk the Windy Canyon/Hirakimata (Mt Hobson) track which is undoubtedly one of New Zealand's best one day walks. There are also shorter walks including the one to Lookout Rock from where the photo was taken. For those keen on boating, fishing or diving there are sheltered harbours and just over the hill magnificent Whangapoua Beach offers sand, surf and safe swimming. Road transport from Port FitzRoy is limited. The People and Post bus leaves Port FitzRoy daily around 11am for the southern end of the island but there is no return trip the same day. It is always advisable to book the bus if you are travelling to connect with a flight or a ferry and essential to do so during peak summer season. Shuttles can be arranged with Mike Newman 09 4290 052 or 021 876 296. There is no tour bus operation based in Port FitzRoy although tours can be arranged in advance with other tour operators. The Port FitzRoy Store Mid December to Easter: Open every day from 8am to 5pm. Then closed Sundays. Fresh fruit and vegetables, off licence, pies, LPG fills, bait, ice and more. The Boat Club is the only tavern in the North Barrier, 200 metres from the Port FitzRoy wharf, past the store. Delicious meals are available. Hours differ during summer and winter so phone 4290 072 or call on Channel One. The Annual Great FitzRoy Mussel Fest is held each year early in January. North Barrier Library Association. The library at Port FitzRoy is membership based for local residents. Over the summer months there are books for sale in boxes outside the library. This is a fundraiser for maintenance of the building and for buying new books. Port FitzRoy Dive Station for tank fills & hire, dive accessories, marine & deep cycle batteries. Barrier Gold specializes in the extraction of kanuka and manuka essential oils. For boaties the Barrier Gold shop is located at the southern end of Port FitzRoy Harbour along from Smokehouse Bay. The Information Centre also sells Barrier Gold products.